Configuring your organisation's chatbots to a high-standard before their deployment will ensure they are an asset to your company. Chatbots are becoming increasingly popular, most typically serving as an additional customer service help feature on company websites. As a result, they play a significant part in the modern customer journey, contributing to updated marketing and customer engagement strategies. As a matter of fact, 80% of companies either already use chatbots or plan to implement them by 2019. Evidently, millennials are driving the growth behind the chatbot market as they are the most likely to adopt the technology. In fact, a recent report revealed that approximately 40% of millennials say they use chatbots on a day to day basis. The preferred use of chatbots by this demographic has led to a huge predicted market growth for chatbots. Numerically, the increase in the market is set to be exponential; from $703 million to $3172 million in 2021, which is a compound annual growth rate of 35.2% between 2016 and 2021. The benefits of chatbot technology are multiple. It is possible to record chats far more easily and cost effectively than other forms of dialogue which also helps companies gain valuable insights into customer behaviour. These insights enable targeted communications which ultimately lead to an improved standard of customer service. However, the service is only bettered if the chatbots are introduced and made to perform in a certain way. So, what are some of the key things that businesses need to consider if they want their chatbots to work for them most effectively? Positioning of the chatbot is essential to its success. Essentially, the chatbot needs to be given certain parameters or defined rules, so that it has a guide when dealing with a customer. The problem is that if the parameters are too ambiguous or complicated, the chatbot does not know how to answer the customer appropriately. This can potentially lead to frustrated customers, which may either break existing customer relationships, harm customer loyalty and/or ultimately impact negatively on a brand’s reputation. With all technologies making use of personal customer data, there is a rising concern about data security and privacy. This leads to the second issue for businesses to consider – transparency. In a nutshell, companies need make sure customers are made aware of whether they are talking to a bot or a human. 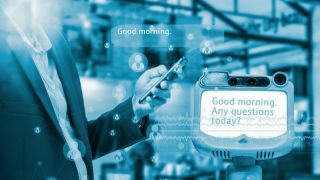 This is supported by research conducted by Pega earlier this year, that highlighted a figure of 77% of British consumers wanting to know whether they were talking to a human or bot while interacting with a chat service online. Naturally, customers argue that they would rather chat to a human, which means that they need to understand the many benefits of chatting to a bot. So, it’s essential that companies clarify that bots are providing 24/7 access to customer service as well as personalised guidance along the way, communicating to customers that that bots are there to help and not to hinder. Thirdly, companies need to bear in mind that chatbots aren’t here to entirely replace customer service but to support it. They should be avoiding the misconception that the “robots are taking over” and enforce that technology is here to help humans do their jobs, not to eliminate their jobs. Using innovative new technology should never come at the expense of the human touch – this is something that customers value deeply, so should not be sacrificed when adopting chatbots. One example of a chatbot successfully being used to support human interaction is when the bot redirects a customer to a human operative when there is an issue that cannot be resolved without further assistance. The requirement for tasks to be effortlessly transferred from bots to humans is part of a wider need for chatbots to fit seamlessly into the rest of the customer engagement system. Therefore, the communication strategy needs to be designed with the chatbot responses in mind, making sure they are in line with the rest of the communication strategy in terms of tone and style. Since the chatbot is dealing with real life customers, it’s also really important that they react with a degree of empathy so as to engage authentically with customers. To come across somewhat authentic and engaging, the chatbot needs to be set up with a set of guiding decision strategies that ensure representation of the brand, as well as a great customer experience. One way of configuring your chatbot is by using a ‘Customer Decision Hub’. This is a tool that programs the chatbot to determine the “Next Best Actions” for customers. The “Next Best Action” is the next step a customer should take, that is determined by an AI based technology that collates existing customer data and any available real-time data to do so. In other words, it helps bots determine how they should respond to customers to optimise customer brand perception. This is an efficient method of supporting and improving the existing customer service team. To achieve success with chatbots, businesses should treat the technology, above all else, as an enhancement to the existing customer experience and a driver of the brand excellence. A high-standard of configuration is key to making sure that chatbots are an asset to the company, delivering appropriate responses and seamlessly engaging with the company’s systems. As consumers are increasingly aware of online security and are demanding transparent use of their data, it is paramount that the firm is truly open about their use of AI. That is the only way that companies can expect their customers to trust the chatbots.